Greater Tacoma Community Foundation is a full-service philanthropic partner, enabling professional advisors to provide powerful, rewarding philanthropy for clients. 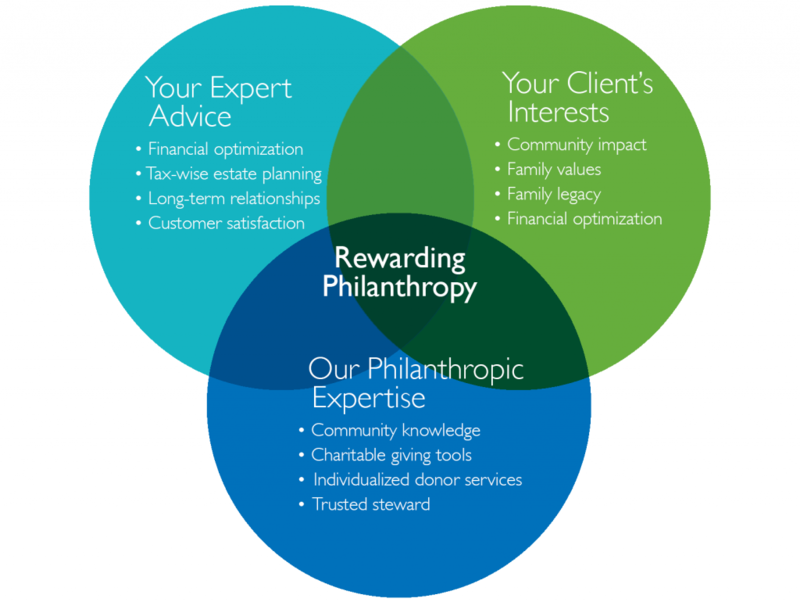 Our planned giving resources are designed to support professional advisors in meeting their client’s philanthropic goals. Along with details about gifts options, planned gift calculators and bequest language, we have a complete tax update service for CPAs, attorneys, CLUs, CFPs, ChFCs, trust officers and other professional friends. The GiftLaw services are made available to all advisors as a free service. By working with us, you gain instant access to decades of philanthropic expertise, nonprofit experience, and strong community roots. Our philanthropic advisors can simplify the many avenues of giving for your clients, recommending strategies based on their interest areas. Greater Tacoma Community Foundation has more than 35 years of experience in philanthropic advising and a deep knowledge of community needs. We can provide you and your clients with the support needed to create powerful, rewarding philanthropy through an engaging experience. Creating a charitable legacy can be one of the most lasting and impactful acts an individual can do, and Greater Tacoma Community Foundation is proud to partner with hundreds of committed individuals who have taken that step. GTCF offers your clients the ability to create a charitable legacy that honors their interests and lets them live on in perpetuity. We can help define the vision for that legacy and choose the giving option that best aligns with that vision. We can enhance your practice. Whether you are ready to refer a client immediately, or would like to learn more about the services we offer, please contact Evelyn Ryberg, Director of Philanthropic Services at 253.345.4172, we would love to work with you.